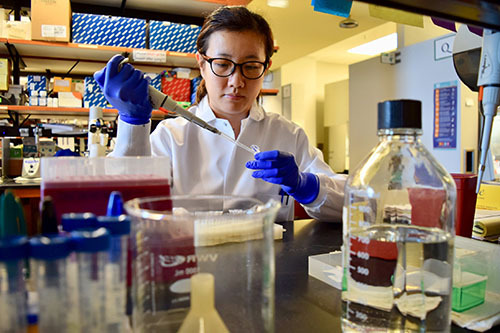 Winship researcher Ruiting Lin has been investigating how dietary supplements contribute to cancer risk as well as cancer drug discovery. Ruiting Lin, PhD, a researcher at Winship Cancer Institute, received a 2018 STAT Wunderkind award on October. 9. The award honors 30 up-and-coming junior life scientists: postdocs, fellows and biopharma employees. STAT News is a life sciences news organization based in Boston. Lin was nominated by her supervisor, Jing Chen, PhD, professor of hematology and medical oncology at Emory University School of Medicine and director of the basic & translational science division at Winship Cancer Institute. "Dr. Lin is one of the most insightful postdoctoral fellows that I have ever had the pleasure to work with," Chen says. "Her recent and future innovative work can lead to true breakthroughs in our understanding of pathogenic links between diet and cancer. I anticipate she will be a leader in this field." Lin and Chen have been investigating how particular mutations driving cancer cell growth distort their metabolism. Some of their discoveries have had surprising implications for diet in the prevention of cancer. For example, Lin found that chondroitin sulfate, a dietary supplement taken to strengthen joints, can speed the growth of a type of melanoma. She, Chen and their colleagues had been studying how a prominent mutation in melanoma cells (B-raf V600E) rewires their metabolism, which provided hints to why that mutation is so common (half of all melanomas). Together with assistant professor Jun Fan, PhD, Lin and Chen also found that arecoline, the stimulant component of nuts chewed in many Asian countries, has anti-cancer properties in the laboratory. Lin was part of a project that identified parietin, an orange pigment found in lichens and rhubarb, as a potential anti-cancer drug. Lin told STAT that in her research, she remembers her aunt, who helped raise her and later passed away from lung cancer. "She triggered my motivation," Lin says. "I want to challenge myself to see if I could make a contribution in the fight against cancer." Lin earned her PhD at Fudan University in Shanghai. In 2016, she was awarded the T.J. Martell Foundation's Clive Davis Research Fellow Award, and she is currently supported by a career development fellowship from The Leukemia & Lymphoma Society.